The room is generously sized to ease mobility. 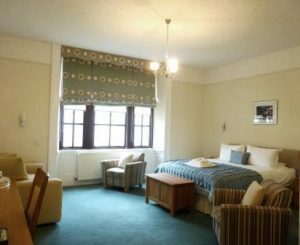 Pentland Lodge House is easily accessed by any infirm or wheel-chair using guest. You can park next to the door. No steps or ramps need to be negotiated from the car park to the bedroom or dining room. 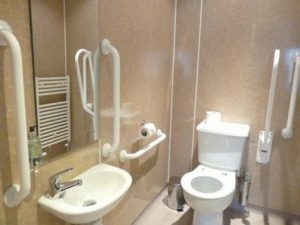 We are very proud of our disabled access room “Cairnmore”. This ground floor bedroom is spacious both in the room itself and in the en suite. It shares all the same features as our other rooms but sockets and switches are set at height for wheel-chair users. Wardrobes and window dressings are accessible too. The zip and link superking size bed can be easily split into two single beds if desired. We have had many guests in wheel-chairs use this room. 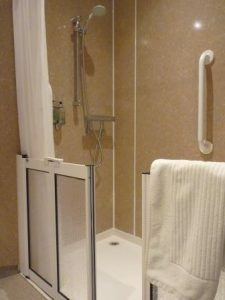 The en suite contains all the standard rails and grabs plus a floor entry double power shower. We can add a chair and additional non-slip mats if necessary. Our shower in Cairnmore is completely flush with the surrounding floor to allow easy accessibility.